Walking tour of downtown Tucson. We've spent many of our February days in Tucson and surrounding area. Picacho, where our RV park is located is about 45 minutes north of Tucson. On this day we took a self-guided walking tour of old downtown Tucson known as the Old Presidio. This area has seen a revival in the last years as far as restoration, clean up and safety. I remember it being not such a good area to visit. Happy to say, it's much different today, we had a realtor tell us it's now "chic" to live in the Presidio area. St Augustine's Cathedral is a very beautiful church. The walking tour is known as the Turquoise Trail...note the turquoise line on the sidewalk. A map from the visitor center corresponded with the painted line and highlighted the buildings and history along the way, it was such an enjoyable and interesting day. Sasco, remains of an old mining town on one of our jeepin days. After leaving Sasco we came across these free range cattle. The desert received a couple days of rain the first of Feb., as a result the desert is very green and lush. Many are predicting a good spring for desert flowers. I sure hope so. The bright yellow Mexican Poppies are just starting to bloom. On another day, north of Tucson, we came across this most magnificent saguaro. 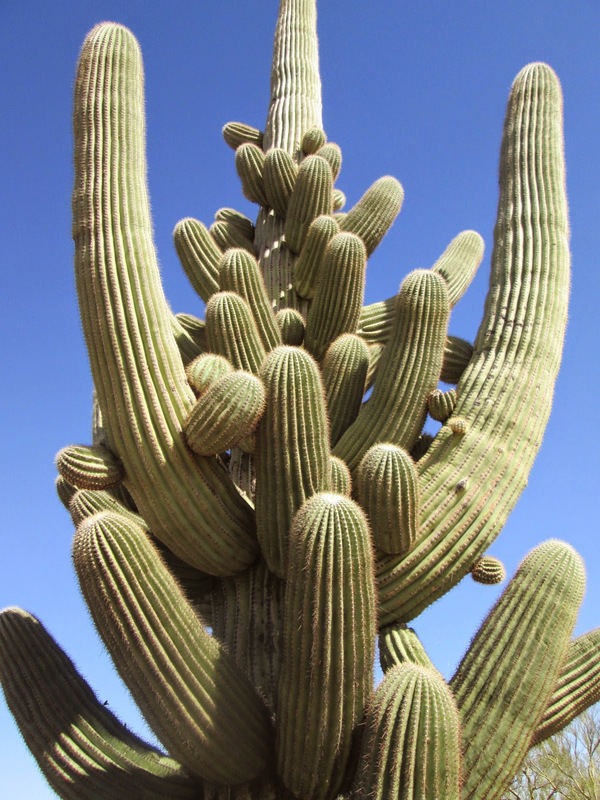 Quite sure we have never ever seen a saguaro with this many arms. We are close to Eloy, Az which is a premier sky dive facility. We spent an afternoon just watching sky divers. People from all over the world come here to jump and train. We had an interesting conversation with a gal from Australia who was spending a month here. The building above is a wind tunnel deal, jumpers can experience a simulated free fall inside a wind chamber. Teams practice in here as well as the military. It's open to the public except when the military is training. It's quite loud inside and out. Not the greatest photo but you can see people that appear to be floating in the wind tunnel. It was fascinating to watch. An old country water tower. We're so amazed at all the crop land around here...crops being mostly cotton, hay and pecans. We've seen some outstanding sunsets. Home at the end of the day. (Picacho Peak KOA). That's us on the end in the middle. Driving back to our RV park from Tucson. Picacho Peak is a very well known icon along I-10. It's hard to believe we climbed to the top of that highest peak! Yeah us! One more day here and we leave for the big RV show in Phoenix. Blog posts will be on hold until we land at our next RV park (by Payson) March 1. Feb 1, we arrived at our new RV park, Picacho Peak KOA, this is home for the next month. The little space next to us is usually empty, there are RV's in front and behind us. I like the vegetation here, a tree right outside our door and huge prickly pear cactus with smooth pads. The tall peak is the well known landmark of Picacho Peak. It's along I-10 midway between Phoenix and Tucson. Our campground is about 8 miles north of the peak. Hiking Picacho is on our bucket list, there is a trail to the very top of that peak. Our hike to the top of Picacho Peak, probably the toughest hike I have ever done. The last mile was steep, including climbs (bouldering) with cables to help maneuver oneself up. The cables were installed years ago to access a beacon light on top of the peak. Gloves recommended. We made it to the top and the view did not disappoint. I-10 can be seen heading south to Tucson. The mountains over Tom's head are the Catalinas that border Tucson. We're amazed at all the farming and crops grown here. Cotton fields are being planted and 1st crop hay being harvested. There are large pecan groves just down the road from our campground. This hike would be near impossible without the cables. Going down was easier than going up. This hike is not for one afraid of heights. I didn't dilly dally long on some of these points, just enough to catch the awesome views. The hike was tough but very worth it. We were thrilled to be in the Tonto Basin Area for the annual Hash Knife Pony Express ride. The Hash Knife was a large cattle ranch in the late 1800's, there are many stories about the Hash Knife cowboys, some including rowdy brawls in the Holbrook area where the ranch was located. The Hash Knife brand continues today. The Pony Express ride has been a continuous ride for 50+ years, thousands of letters are carried on horseback from Holbrook to Scottsdale AZ, a distance well over 100 miles. The riders and horses switch every mile. Approximately 30 riders make up the pose. This is a unique ride in that it is sanctioned by the USPS, the riders are sworn in before the ride. The photo above is the group arriving at the Payson Post Office. Welcoming ceremony at the Payson post office. The cowboys signed bandannas with the AZ flag design. I particularly liked this rider, his name was Walter, he had a beautiful horse. He's the only rider I asked to sign my bandanna. It was fun watching all the kids, they looked to these cowboys like rock stars, waiting in line trying to get all their signatures. After the ceremony the riders rode off, down the middle of the street... images of the old west. They spent the night in Payson, the horses were put up at the fairgrounds. Interesting side note...the pony express was successful in carrying mail and critical news to the west coast but only lasted 18 months due to the telegraph coming into existence. The fastest ride from MO to CA took 7 days, most rides being 10-13 days. Our last weekend (Super Bowl weekend) saw Tonto Creek flood. We watched the two trucks go thru the first water and waited to see if they were going to attempt the next which is deeper, wider and swift. They did not, turned around and came back. Smart. The white seen in front of the mountains are houses, people living there had what's known as "creek days". That about wraps up January, my next post will be the start of February and our new campground. I haven't yet figured out how to fix the dates on my posts. It automatically dates the post when I add it. Our first month was amazing, the time flew by. We feel so lucky to be on this adventure. These trees are growing in the higher elevations around Tonto Basin, on this day we took the El Oso trail to the top of the Four Peaks Mountain Range. I'm not sure of the elevation but it was too cold to do the hike we had planned. I'm still trying to find out the name of this tree that is brilliantly colored red on one side and grayish on the other. The horse pictures are especially for my Mom and anybody else that enjoys horses. There are many ranches in the Tonto Basin area. This ranch was having a horse driving seminar and demonstrating a gizmo behind the horses that moves dirt. A skeleton from a dead saguaro. 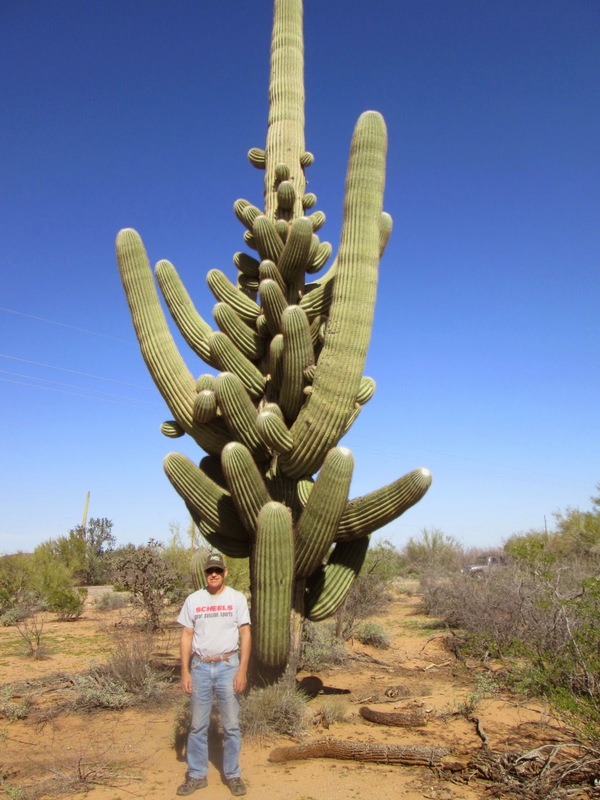 The wood saguaro ribs are often collected for wood type crafts or garden decor. We've seen old abode houses with ceilings made of of saguaro ribs...unique and beautiful. A second visit to the Blue Bird Mine, that's us walking in the canyon back to the mine. Good biking trails as well. The weather has been perfect for these outdoor activities. Still in our month of January. Heading out to go "wheeling" crossing Tonto Creek on the back side of Punkin. At the end of the month the creek flooded from 2 days of rain, people on the other side were unable to cross into town. Creek Days. background in front of the mountains. On a trail that leads to the abandoned BlueBird Mine. A small mine that has been closed for years. I haven't been able to find much info on it as to what was mined there. The trail was 4-wheeling to say the least. If you look closely, you can also see our trail into town. The BlueBird Mine. It was a nice little hike up a canyon to reach the mine. Found some cool rocks but no gold. I got out and walked at this point. Our jeep is too stock to do many trails like this. End of day, back into Punkin. Late afternoon at Roosevelt Lake. The lake has many different looks, depends on time of day, lighting and what side of the lake you're on. The lake is the result of the Roosevelt Dam completed in 1911, it was named after President Theodore Roosevelt. Our first week in Punkin we set out to find the remains of Camp Reno, but no luck. A later attempt proved successful. All that's left of Camp Reno are stone walls...and the history. Camp Reno was an outpost established to protect settlers and prospectors looking for gold. Indian raids, most notably from the Apaches were a constant threat. Abundant gold was discovered in this area...still today people find gold. In fact I saw a gold panning kit in a local hardware store and was tempted to give it a whirl. Maybe another year. This outpost was so remote, difficult to keep soldiers supplied, it was in existence less than 5 years. When the girls were here we went cholla hunting. When the cholla cactus dies the meat of the cactus rots away and leaves an interesting wood from the inside. It's popular with crafters and often seen as decoration in gardens. The sun was setting and painted the desert with a beautiful peace. The cholla cactus is beautiful to look at but one must beware, it's called jumping cactus because the slightest brush against it results in a clump being attached to one's limb, and it does not feel good. All for tonight. Jan. continues tomorrow. After being without internet for a couple weeks we're back in business. I have much to share to finish out our month of January. While staying in the Tonto Basin (Punkin Center) we spent time hiking and jeeping in the Salome Wilderness Area. The desert here seems very healthy and so beautiful, it's definitely wilderness, acres and acres of wilderness. We would be on trails for hours and never see another soul. This trail in the Salome was named THE JUG, probably because of the deep pools of water. Some of the pools can only be reached by repelling down cliffs, something we don't do. However, we were able to scramble boulders to get down to this pool. I loved the heart shaped boulder with bamboo growing behind it. One of God's whispers. More from THE JUG trail. There are lots of saguaros in the Tonto Basin. We attended the Barrett Jackson Auto Auction, a week long event. The Barrett & Jackson Auto Auction is held every January in Phoenix. This year thousands of immaculate autos were auctioned off, the most expensive selling for $500,000. There were model T era cars, muscle cars, prototypes that never made the production line to a very unusual tour bus made by GM (sold for 4 million), photo above. We spent the day there and didn't see all the cars. Chevy, Ford and Dodge had large outdoor displays along with a small race track where they offerred “hot lap” rides with professional race car drivers. Figured we’d never get a chance like that again so we got in line. My first hot lap was in a Ford Mustang (photo), we peeled out, skidded and squealed around the corners and when I opened my eyes we were crossing the finish line. Driver Drew said he wanted to give me a good ride, ha ha. I think he just wanted to see me scream (but I didn’t). Tom got a lap in a Mustang Shelby and then we both took a second hot lap in a new Corvette, only this time I asked the driver to go a bit slower. Was thrilling and fun. I liked the colors in this row of old trucks. The vehicles all so clean they sparkled with the overhead lights. There are several Indian ruin sites in this area. Fortunately the Forest Service has taken this site under their wings to help preserve and protect it from vandals and the elements. We were told there are others that are not protected, kind of wonder if there's anything left of them. Above are the Tonto Ruins from the Salado Indians. The Salados are thought to be some of the first people to use the Apache Trail as a footpath. Interesting side note...at the bottom of this trail by the visitor center we met an elderly couple from New Auburn WI, a neighboring town to Chetek. The trail up is paved but too steep for many that have difficulty walking. Beautiful views on our way to Young. A day trip to the remote town of Young was another scenic drive with lots of oohs and awhs. This town has only one road in and one out, most of it dirt. The road is called “Desert to the Pines” because you start out driving in the desert and climb up into the pines to snow level, over the mountain then desend into the Pleasant Valley which was the former name of Young. It’s a beautiful green valley, we didn’t see any industry, mostly ranching. This is cowboy country...cowboy hats, boots and dusty trucks. We had lunch at the Antlers Restaurant, we loved the quaintness (wood stove in dining area) as well as the good food. Interesting side note...Young didn’t get electic service until 1965. History includes the Pleasant Valley War waged between two ranching families that continued for years with many lives lost. Hard to believe this is the only road into the town, or out, depending on what way you're traveling. 23 miles to go. Not the greatest picture but wanted to show you the road as one travels into the town of Young. In the Pleasant Valley entering Young. Will continue with more tomorrow. Erin, thanks for the blogging tips.